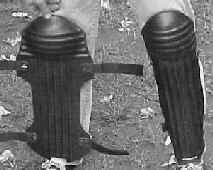 The Security Devices knee/Shin pads are made of thick rubber that provide comfort when kneeling and some protection against the environmental fragmentation associated with an anti-personnel mine blast. The pads attach using velcro straps. They can be trimmed to length using a sharp knife. These pads have been found in tests to offer significant blast protection from AP mines 75cm away. However their performance against fragmentation is unknown. They are intended as an aid to kneeling on rough or damp ground rather than as protection against a blast. Easily attached, they extend from the ankle to the knee without restricting leg movement or the ability to kneel and stand easily. Those deminers who have tried them said that they wanted to have them available to use whenever the ground is wet or rough. The nominal dimensions of the knee shin-pads are 46 x 15cm and they weigh around 1Kg (2.2 lbs). These knee-pads have been blast-tested and performed well, but they do not offer guaranteed protection to any international standard. If you need lower leg frontal protection to NATO STANAG 2920 450m/s. we offer the same design made using the same armour as in our aprons. Please ask for a quotation. 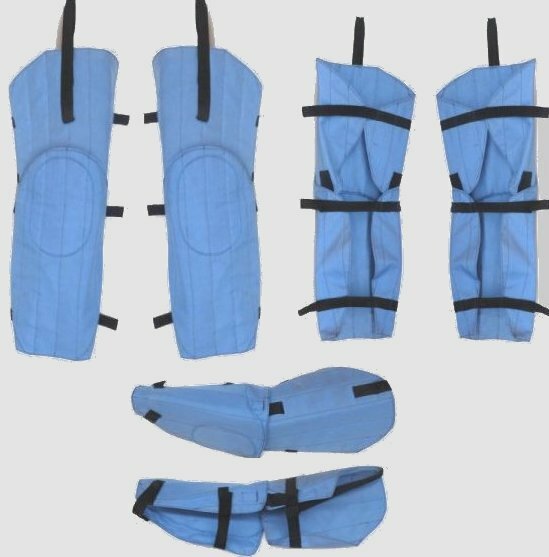 For Dog handlers or those using a Rake system that involves demining in a standing position, full frontal leg protection can be provided. ...and although the need may be rare, we can supply arm protection to your specifications as well. blast tested to ensure that safety has not been compromised.